Organic protein for your muscles, with superfoods to support your body, this is superior protein. Our mindfully crafted plant-based blend provides 16 grams of easily-digestible protein to help replace what your body is using. The addition of spirulina, alkalizing grasses, and phytonutrient-packed fruits creates a wholesome, all-in-one, nutrient-dense shake. We left out the processed stevia, xanthan gum, and artificial ingredients. Best part, it’s amazingly smooth and delicious. 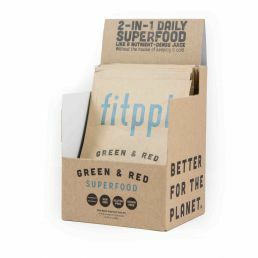 We combined organic plant proteins and superfoods to fuel anything you do. The body not only needs protein to fuel your muscles, but micronutrients from superfoods to support your body. 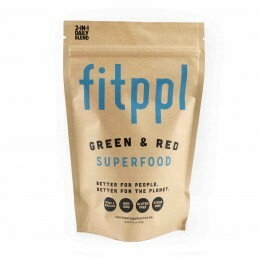 We released the first protein superfood on the market. Many have copied since, but none are as delicious and nutritious. The perfect all-in-one protein to complement your lifestyle. Our nutrient-rich blend of organic protein, alkalizing cereal grasses, spirulina, and phytonutrient-packed fruits helps you maintain optimal health and performance. The addition of these powerful superfoods creates one of the most nutritious and supercharged plant-based proteins around. Perfect for your everyday active needs. A Better Protein For People. 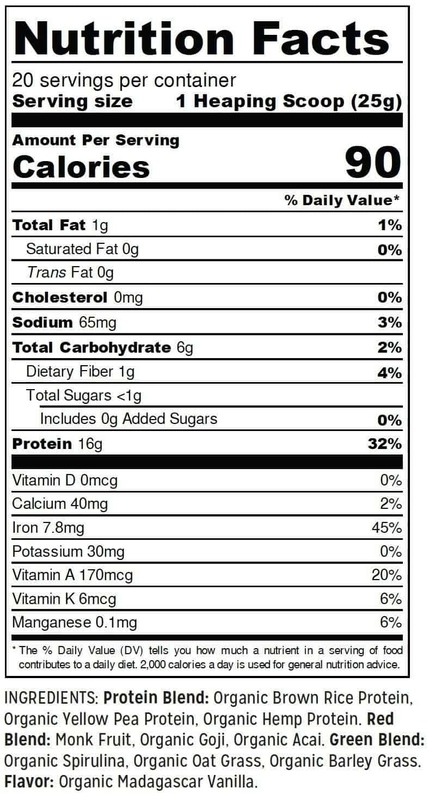 We’ll be frank, most proteins are full of sh*t. Processed stevia, xanthan gum, and emulsifiers. Emulsifiers are ingredients like polysorbate 80, lecithin, carrageenan, polyglycerols, and xanthan and other gums. These are not that great for you. A new study in the journal Nature suggests these ingredients may be contributing to the rising incidence of obesity, metabolic syndrome, and inflammatory bowel disease by interfering with microbes in the gastrointestinal tract, known as gut microbio. Stevia can be processed, mixed with chemicals, blended in a hundred ways, and still legally be called simply stevia. We don’t include any of the crap. A Better Product For The Planet. Plant proteins are lower in saturated fat, free of the growth hormones and antibiotics often found in animal proteins, easy to digest and a more sustainable option for the environment. Thank grass-fed is the answer? Think again. Grass-fed beef isn’t necessarily more sustainable than grain-fed beef. Because grass-fed cows consume a more complex carb and grow more slowly than their grain-fed counterpart, they produce more methane while making the same amount of meat or dairy. Up to 400% more methane, to be exact. So let’s just leave the cows alone. We’re Non-GMO project verified, Certified Gluten-Free, Vegan.org Certified, and Certified B Corp. Which means our products undergo rigorous testing and traceability from farm to doorstep. We take it a step further and leave out the low quality ingredients like stevia and gums which are highly processed. The smooth flavor comes from organic Madagascar Vanilla and is enhanced by one of the most recognized superfoods in the world, goji. The addition of antioxidant rich acai and monk fruit gives it a mild sweetness, which is ridiculously delicious in smoothies and recipes. 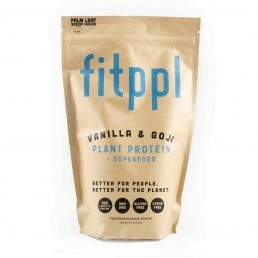 Unlike other protein powders, the unique, earthy flavor of fitppl Vanilla & Goji comes from the ingredients within. Each product has an unique impact score that represents how much litter is removed at our cleanups. Inside you’ll find a palm leaf scoop made from naturally fallen areca palm sheaths, which are 100% biodegradable and completely compostable. Pictured is 1 heaping scoop. Approximately 25 grams. Great for those with lactose intolerance, gastrointestinal issues, or simply wishing to avoid rBGH hormones and various preservatives added to dairy. Rice protein is hypoallergenic and will not upset the stomach. Our organic brown rice protein is extracted using a low heat process to avoid protein denaturation. 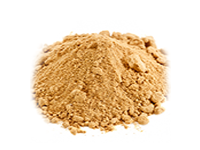 It is enzymatically extracted from multiple layers of the whole grain instead of the more typical rice protein, which is hexane-extracted from only the bran layer. Açaí is an indigenous berry commonly found in the rain forests of the Amazon. 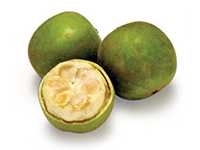 This antioxidant-rich fruit has been heralded for its healing, immunity-promoting and energy-boosting properties. Acai is an exotic relative of the blueberry and cranberry. 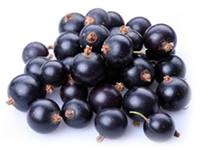 Research has shown that this antioxidant-rich berry may be able to assist in the prevention of diseases associated with oxidative damage, as well as provide many other health benefits. 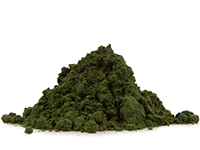 Spirulina is a blue-green algae that grows naturally in oceans and salty lakes in subtropical climates. One of the special characteristics of spirulina is its rich protein content—approximately 65% percent protein by weight. It also contains all of the essential amino acids, 10 of the 12 non-essential amino acids plus a potent array of other beneficial nutrients. Vanilla has a number of naturally occurring antioxidants. 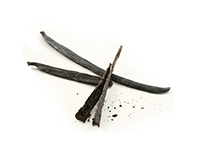 These natural antioxidants give vanilla its health benefits and also contribute to its unique aroma and flavor. 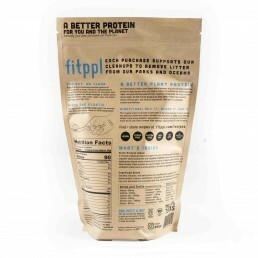 Pea protein is also hypoallergenic and is packed with branched chain amino acids. Studies show a diet rich in branched chain amino acids can help keep the body in a muscle-building state throughout the day, decrease belly fat, control hunger between meals, energize workouts and much more. 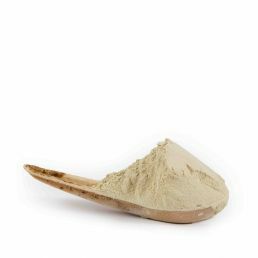 Our yellow pea protein is extracted through a low heat water extraction process, to avoid protein denaturation. Also known as wolfberries, goji berries have long been appreciated in China and the Himalayas for their sweet taste and bright color. Ancient Chinese medicine established goji as a medicinal fruit and goji berries still are used to treat eye, liver, and kidney ailments. Studies have cited the high level of antioxidants in goji berries, especially zeaxanthin, which gives goji berries their bright color. Organic Oat Grass Oat Grass has been a significant source of food for animals and humans since prehistoric times. Oat grass has beta-carotene, vitamins K and C, folic acid, calcium, iron, protein, fiber, and B vitamins, has up to 30% protein and is a rich source of chlorophyll – nature’s blood cleanser. No stevia. No weird words. Hemp’s reputation has flourished as its health benefits continue to be revealed. Hemp contains several essential nutrients for the body. One particular benefit of hemp is that it provides easily digestible protein. 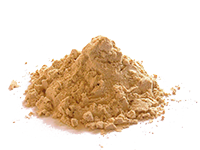 Hemp protein is also rich in fiber which has a number of valuable, health-promoting properties. Monk fruit is a small, sweet melon that has been recognized over many centuries for its healing ability. Also known as luo han guo, monk fruit’s use dates back to the 13th century. Its Western name honors the monks living in the steep mountain region of Southern China, where it was and still is cultivated. Monk fruit’s antioxidant and vitamin properties have made it a popular remedy for anything from a sore throat to diabetes. 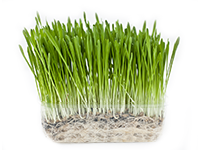 Barley grass is a nutrient-rich superfood; a significant source of powerful antioxidants, essential amino acids, vitamins and beneficial enzymes. 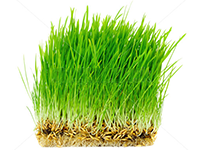 Barley grass also contains an abundance of electrolytes along with essential minerals such as magnesium, phosphorous, potassium, zinc, iron and calcium. Also known as wolfberries, goji berries have long been appreciated in Asia and the Himalayas for their sweet taste and bright color. Ancient Chinese medicine established goji as a medicinal fruit and goji berries still are used to treat eye, liver, and kidney ailments. 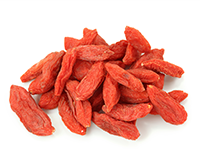 Studies have cited the high level of antioxidants in goji berries, especially zeaxanthin, which gives goji berries their bright color. No stevia. Nothing to google. If you don’t love it, keep it and we’ll give you a full refund including any shipping cost. Seriously, no catch. Mix 1 heaping scoop in 6 ounces of almond milk, hemp milk or beverage of choice. Enjoy during breakfast, on-the-go, post-workout, or anytime throughout the day as a snack. You can also blend with your favorite smoothie or add to your raw or baking recipes. There is some confusion with cereal grasses and gluten. Gluten is found only in the seed kernel, and not in the stem or grass leaves. 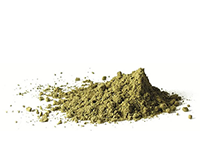 When making cereal grass powders or juices, the leaves are trimmed and used because the nutrients are in the green pigment of plants (leaves). The seed is not used. Store in a cool, dry place. Make sure bag is resealed after use. 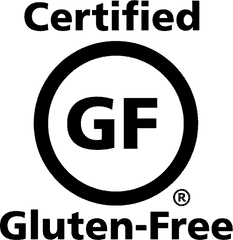 Emulsifiers are ingredients like polysorbate 80, lecithin, carrageenan, polyglycerols, and xanthan and other “gums.” They are used to improve the texture and shelf-life of many foods, from ice cream and baked goods, to salad dressings, veggie burgers, non-dairy milks, and hamburger patties. A new study in the journal Nature suggests these ingredients may also be contributing to the rising incidence of obesity, metabolic syndrome, and inflammatory bowel disease by interfering with microbes in the gastrointestinal tract, known as gut microbio. We do not use any emulsifiers. Below you will find heavy metal testing for each of our ingredients. Technical standard is an established norm or requirement testing must fall under. We test well under each technical standard. If the company you're using doesn't have results listed. Ask. Or just switch to fitppl since we're transparent from the start. My wife is a certified nutritionist who swears by fitppl. The best all natural plant based protein powder around. I love it after a workout. Best Vegan Protein Powder on the Market! Love that fitppl does not contain stevia nor does it overpower the flavor of my daily fruit and green smoothies. Was also happy to verify that the powder ingredients are mostly if not all organic and will receive that certification soon. Lastly, the fact that fitppl hosts regular trash clean-ups and is conscious of its environmental impact will keep a customer for life. Love mixing it in with and smoothie In The morning! I've heard so many good reviews, but I cannot stomach it. Strongly recommend a taste test. I gave it two stars because I realize the quality of the product, Just not for me. Hey LaDawn! We've email to initiate your refund. You're covered by our love it guarantee! 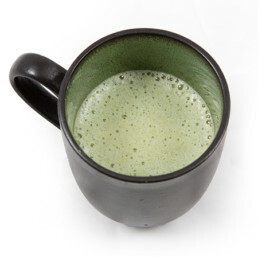 Most people find the taste light and pleasant, but it can be a bit earthy for some since we don't use stevia or sugar. I work out quite a bit and have tried MANY other protein powders. I discovered this product on a in depth research project for a vegan shake. 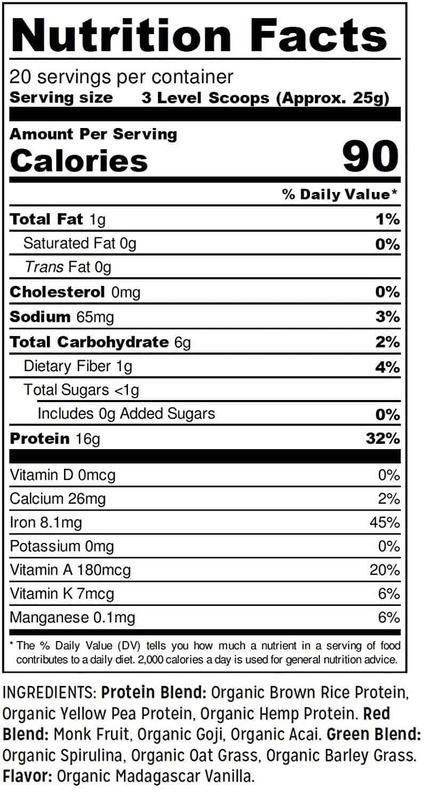 It has all the items that are important to me in a powder: - rice base, organic, tasty, texture is smooth, GREAT macro panel (high protein, low carbs, very low fat and low sugar), gluten free, no added garbage/vitamins, soy, corn, dairy & lactose free, very easy to digest and decent pricing I have been purchasing this protein now for many years. This is a GREAT vegan rice protein you can find on the market to cover all the items above. There are many out there but this one has all the points addressed. I used to use Whey simply because of the protein. I am not vegan/vegetarian but I HIGHLY recommend this if you trying to achieve results, eliminate some meat/dairy and are simply looking a protein value powder. I have even tried some other powders to compare and mix it up. However this one of my best.